During the late 19th century St. Stan’s Parish was the center of religious life for the Polish immigrant. As immigration dramatically increased during the 1880’s the Polish community in Buffalo continued to grow. As the neighborhood expanded St. Stan’s Parish grew larger, with many of the faithful making a long and difficult walk to come to church to worship. The journey to St. Stan’s became increasingly more dangerous since the faithful needed to pass the N. Y. Central Rail Terminal and cross the dangerous central train lines. The train tracks took many lives before St. John Kanty was established to serve the needs of the expanding Polish immigrant community. Rev. Jan Pitass decided to divide St. Stan’s and form another faith community. Although he feared it would weaken the ties among immigrants, Fr. Pitass realized the great need for another parish since the membership of St. Stan’s had reached over 20,000. Original altar of St. John Kanty Church. Note The Lord’s Supper carving, which after the fire in 1955, was relocated to the back of church, under the choir loft. 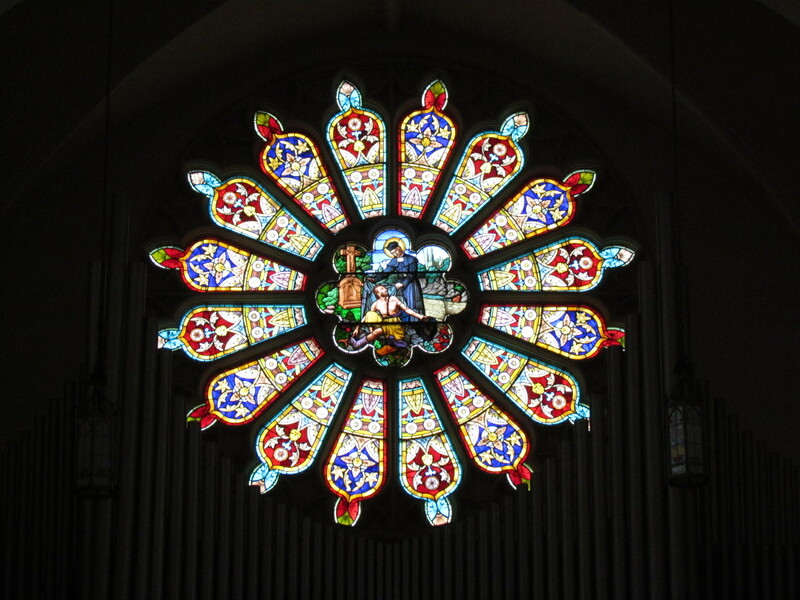 The Rose window at St John Kanty (click on photo to enlarge). Rev. Thomas Flaczek served as the first pastor of the new St. John Kanty Parish Community from 1892-1895. During his tenure the parish was composed of over 250 families with over 300 children. On September 4, 1894 the parish school was opened with an enrollment of 325 children and a staff of three Felician sisters and three lay teachers; that is an average of over 50 students per teacher! By 1925 enrollment had reached a peak of 1,574 students. By 1927 Fr. Garstka, who served as Pastor from 1910-1941, was pressed for the need of a new school auditorium. The school basement could only accommodate 300 people and was already condemned by the Fire Authority as unsafe, since it lacked proper exits and ventilation. After three years of deliberation, Fr. Garstka chose J. Zakrzewski & Son to construct a new Lyceum Building. Eight parcels of land (including homes) were purchased at a cost of $53,000. Bishop William Turner granted a loan of $350,000 for construction. Groundbreaking for the new Lyceum took place on June 30, 1930. Envisioned as a center for the moral, physical and spiritual development of the community, Bishop William Turner laid the cornerstone of the Lyceum on September 29, 1930. The main hall could hold 2000 people for concerts, movies, dances, plays and meetings. Equipped with the latest sound and lighting equipment, the movie sound projector was on par with downtown theaters. The Lyceum also housed two classrooms for 8th grade, six bowling alleys, club rooms, meeting rooms and a gymnasium. On September 13, 1933 the Lyceum was finished and officially dedicated by Rev. Msgr. Francis Kasprzak. During the depression years the Lyceum served over 1200 students through a Federal Grant for an adult education program. In 1937 Rev. Stanley Kulpinski established the Labor College, and 32 teachers taught courses in the arts, drafting, public speaking, and carpentry. During the 40’s and 50’s the Lyceum was the poplar gathering place for dances featuring the ‘big band’ sounds. In 1942 the church celebrated its 50th Anniversary. The artwork in the church Sanctuary was repainted for that occasion by local artist Jozef Mazur (http://en.wikipedia.org/wiki/Jozef_Mazur;http://albionpolonia.com/mazur). Ironically, Mazur was christened at St. Adalbert and early in his career decorated the same church with his paintings. In 1948 a fire occurred in the sanctuary of the church just one year after the mortgage for the Lyceum had been paid. Repairs were made to the walls of the sanctuary and nave, and the mural in the apse of the church had to be repainted. On January 12, 1955 a second fire raged through the church. The three alarm fire engulfed the interior of the church, still decorated for the Christmas season. Ten stained glass windows burst from extreme heat pressure, and organ pipes fell to the church floor. The fire also destroyed the wooden main altarpiece, two side altars, murals and statuary. Remarkably, the life size sculpture of The Last Supper, originally set in the main altar, was saved. The sculptor, Frank Pedevilla, lived and worked in the Rochester area. Originally intended for the Cathedral of Notre Dame in Montreal, because of the additional border crossing fees Notre Dame was unable to accept delivery. Seen in a store window by someone from St. John Kanty, a deal was struck for the purchase and delivery to the East side church. This magnificent wooden sculpture now rests in the choir loft for all to see. Carving of Last Supper, originally located in the Altar but relocated to in front of the choir loft following the fire of ’55. By the 1960’s the Jozef Mazur was again busy, this time as both glass stainer and painter, (http://www.buffaloah.com/a/DCTNRY/mat/stained/mazur/tc.html), creating four new stained glass windows for the Sanctuary as well as the painting of Christ the King, the angels and the cherubs in the apse. The primary features of the window honored Our Lady of Czestochowa (donated by the artist), Jesus in the garden with the little children (paid for with pennies raised by the school children), Pope Pius X, the first advocate of frequent communion, and the Blessed Mother and Child with St. Dominic de Guzman and St. Catherine of Sienna, a gift of the Father Justin Rosary Hour (see Artistic Highlights of St. John Kanty Church on this site).original school building at Broadway and Brownell and become clearly inadequate. In 1967, as the parish celebrated its 75th anniversary, Msgr. William Wozniak undertook a $300,000 campaign to renovate the Lyceum building into a new school building. By the 1970’s, as more parishioners lived further and further from the East side community, St. John Kant adapted by offering new ministries far beyond the scope of Catholic schools. Under the direction of Msgr. Robert Golombek new ministries began to develop. In addition to being a school, the Lyceum became the home of a senior citizens community center. The Mother Angela Dining Room was established to feed the poor and hungry of the area. In 1990 St. John Kanty School merged with five other parish schools to become a new regional education complex, Kolbe Catholic Regional School. As St. John Kanty Parish entered its centennial year in 1992, the pastors of the eight East side parishes established the East Side Regional Planning Commission. Recognizing the need for new forms of ministry for the future of the Catholic church in East Buffalo, the Commission was chaired by Rev. Jerome Kopec, then pastor of St. John Kanty. The centennial year thus marked a time of transition, which saw further ministries develop as a new century and new ministry emerged for the parish. Religious education programs were increasingly directed by lay persons of the parish. Felician sisters who once served exclusively as teachers, now worked as pastoral ministers in the total experience of parish life. With the theological developments of the Second Vatican Council, lay persons served as lectors and Eucharistic ministers. The Rite of Christian Initiation of Adults (RCIA) was instituted as a new form of evangelizing to reach other members of the community with the word of God. In 100 years 17,603 children were sanctified through the waters of baptism; 5,727 couples were joined to Christ through holy matrimony; 17,510 souls were commended into the hands of their loving Creator; 34 men were called to priesthood and 40 to religious life. By agreement with St John Kanty Church, the Catholic Cemeteries of the Buffalo Diocese manages St. Adalbert’s two cemeteries (1621 Dale Road, Cheektowaga and 6200 Broadway, Lancaster) (http://buffalocatholiccemeteries.org/LOCATIONS/StAdalbert.aspx). In June 2014 the St John Kanty Garden Mauseoleum was dedicated during a Mass offered by Bishop Edward Grosz. 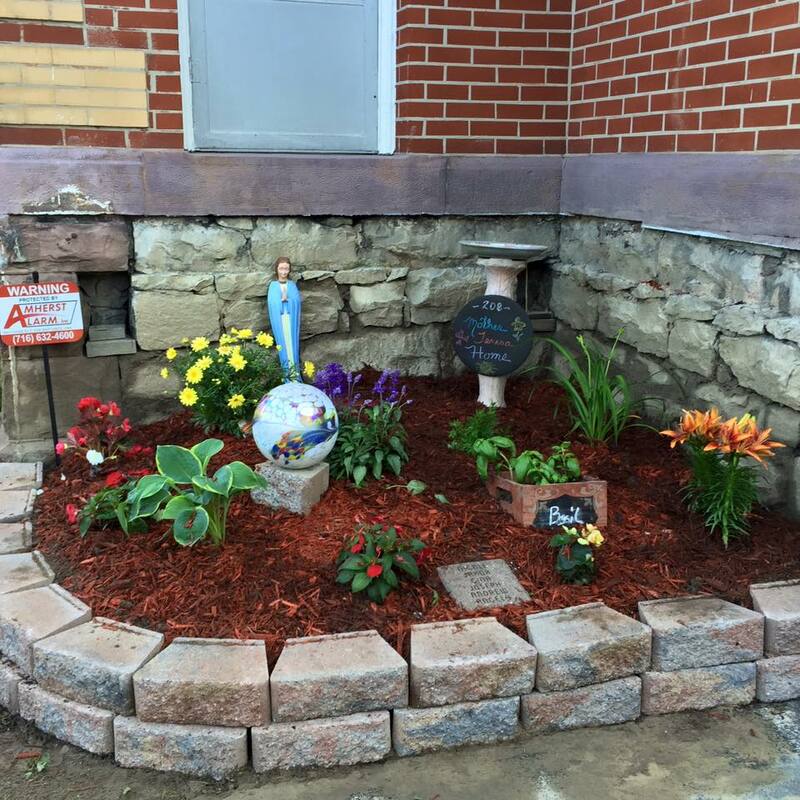 In June 2015 the former rectory of St Adalbert’s at 208 Stanislaus Street was purchased by the Diocese of Buffalo, Department of Pro-Life Activities. Although not yet open, the Mother Teresa Home, a transitional residence for women who are pregnant or have infants, is getting ready to open its doors after completion of renovations. The building will be occupied by Pro-Life Director Cheryl Calire and her husband for a period of 5 years. The goal of the Mother Teresa Home will be to transition the residents back into the world with marketable skills learned at The Response to Love Center, located just across the parking lot (click on photo to enlarge).